Information on jobs and careers in science and engineering. The video also makes the point that what separates Silicon Valley is the engineering talent. 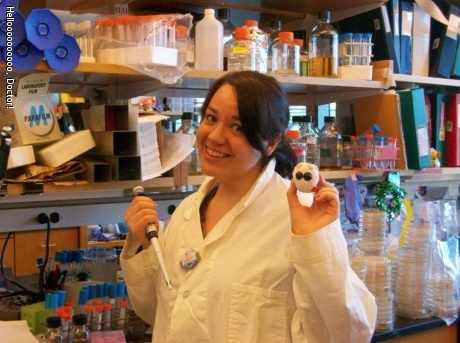 A nice simple post by a soon to be Dr. of Genetics and Molecular Biology on what being a scientist is like for her. I like her take, which I think is much more accurate than some of the generalities people use. The main reason people (men or women) become scientists because they want to be scientists. The truth is science requires you to be social. We share ideas, techniques, and equipment. A good scientist knows her limitations and uses someone else’s expertise when her own is not enough. The modern scientist communicates not only through conferences and journals, but also through blogging and Facebook. When a non-scientist (usually my parents or some other close relative) asks me about what I do, they inevitably want to tie it back to how I’m curing a disease and saving the world. I am not curing a disease or saving the world. I study science because it’s cool. I study basic science — asking questions for the purpose of learning the answer. That doesn’t mean what I do isn’t important. Lots of ground-breaking medical advances have been made just because someone asked a question no one else thought to ask. To all you ladies fighting the good fight in other fields, keep at it, because the numbers are going up for women with advanced degrees. I’ve always wanted to be some sort of scientist. When I was in elementary school I wanted to be a paleontologist because dinosaurs are awesome (and so was “Jurassic Park”). When I was 11, I read the Hot Zone and knew I wanted to be a biologist. Though there were times that I flirted with the Dark Side, i.e., medical school, but mostly only because when my teachers figured out I was good at science they said go to medical school. No one even suggested becoming a scientist. Great stuff. Good Luck, Caitlin.